Marvel’s mega movie, The Avengers, will be taking over the blog for the next few days, as we explore the films that will be joined together by this upcoming cinematic event. First up is Thor. 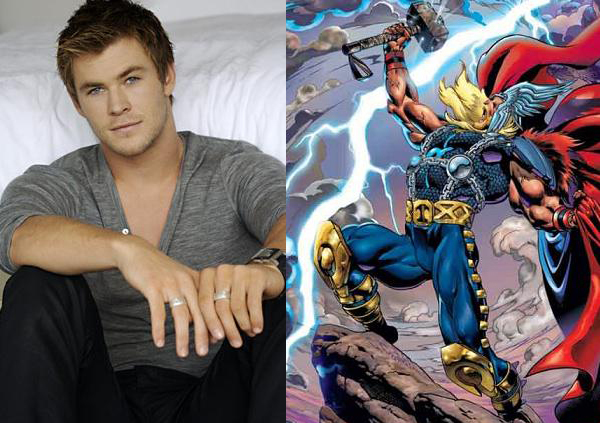 Thor is a god and is based on the Norse God of thunder, also called Thor. 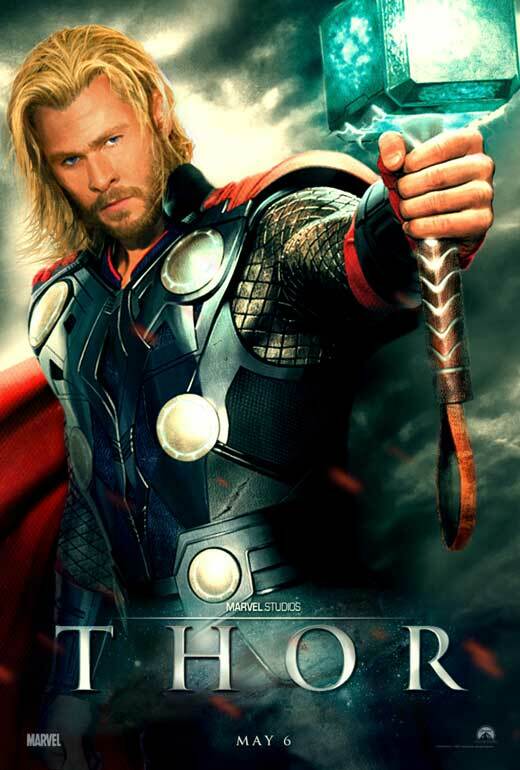 Thor, the Marvel character, is one of the founding members of the Avengers. 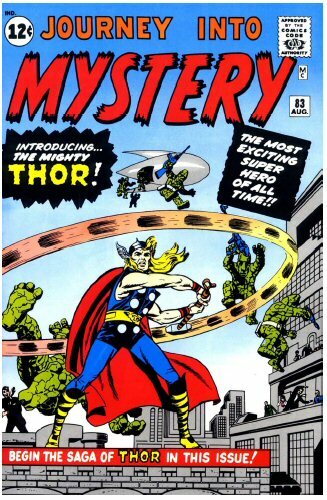 Thor made his first appearance in, the 1962 comic, Journey into Mystery #83. He is arguably the physically strongest member of the Avengers. In the comics Thor is sent to Earth, by his father, to learn about humanity. Thor is stripped of his memories and put into the, already existing, body of a medical student, Donald Blake. Years pass and Thor still has not regained his memories, then one day, while being attacked by alien forces, he finds his hammer in a cave. When he uses it to smash a rock, he is transformed back into his true form and his memories return. Thor defeats the aliens and goes on to leave a double life as both Thor and Donald Blake. He even has a love interest, Jane Foster. The movie follows a similar, but not identical, story. In the film, Thor is sent to Earth as a punishment for his reckless behaviour; that consequently restarted an ancient war. The trailer also shows that in this version he does not suffer from any memory loss. Until I saw the trailer I was sceptical of the cast, especially Chris Hemsworth as Thor, but my fears have been put to rest, as it looks fantastic. The movie seems like an action packed thrill ride, so if you liked Iron Man you’re probably going to eat this up. In fact Thor’s hammer appeared in a stinger, post-credit scene, at the end of Iron Man 2. The movie stars Chris Hemsworth as Thor, Natalie Portman as Jane Foster, Tom Hiddleston as Loki, Thor’s adopted brother, and Antony Hopkins as Thor’s father Odin. Clarke Gregg reprises his role as S.H.I.E.L.D. agent Phil Coulson, who he previously played in Iron Man 1 and 2. The movie is set to be released, in 3D, on the 6th of May 2011 in America. This movie is a must see, if you want to see The Avengers movie that is. Save the universe one comment at a time. Leave a comment and vote below. Also don’t forget to check back tomorrow for the next Marvel movie preview. This entry was posted on February 10, 2011 by adamodwyer1. It was filed under Superhero and was tagged with #83, 3d, antony, avengers, blake, book, cast, chris, clarke, comic, coulson, date, donald, father, foster, god, gods, gregg, hemsworth, hero, hiddleson, hopkins, into, jane, journey, loki, marvel, movie, movies, mystery, natalie, norse, odin, origin, original, phil, plot, portman, premise, release, story, superhero, the, thor, thor's, tom. I think it you will like this movie, can’t wait to find out for sure.